Fire-weapons have been used from ancient times. Napalm-like weapons were used by and against the Romans and Greeks. One term used for them was “wildfire”; another was “Greek fire”, as incendiaries were widely used by the Greeks. Some ships were equipped to shoot other vessels with flaming oils emitted from tubes in their bows. Individual soldiers were equipped with flaming oils that they could shoot through reeds in a kind of fire-breath. But the use of incendiaries declined as longer-range projectiles were created, such as rockets (e.g. the British rockets mentioned in the US national anthem).Incendiaries were always regarded with particular awe and horror, as they invoked the terrors of hell and being burned to death. As the ability to project incendiaries over long ranges increased in the 19th century, the weapon again came into use. The major turning point that would see an unprecedented rise of fire-weapons was World War II. With Germany leading the way, Japanese and British forces also used incendiaries to devastating effect, but the weapon would be taken to new heights by the United States. Initially, US officials said they wanted to avoid the “area bombing” – killing everyone in a large area – that was being carried out by the above groups on various cities. But soon they abandoned this approach and embraced the method. Wanting to further increase their ability to destroy large areas, and with particular regard to the wooden cities of Japan (66), the US Chemical Warfare Service assembled a team of chemists at Harvard to design an incendiary weapon that would be optimal for this goal. As the team progressed in its development, the military built replicas of German and Japanese civilian homes – complete with furnishings, with the most attention devoted to bedrooms and attics – so that the new weapon, dubbed “napalm” (a portmanteau of chemicals napthenate and palmitate) could be tested. In all of these replica structures, which were built, burnt, and rebuilt multiple times, only civilian homes were constructed – never military, industrial, or commercial buildings (stated multiple times, e.g. 37). In 1931, US General Billy Mitchell, regarded as the “founding inspiration” of the US Air Force, remarked that since Japanese cities were “built largely of wood and paper”, they made the “greatest aerial targets the world has ever seen. … Incendiary projectiles would burn the cities to the ground in short order.” In 1941, US Army chief of staff George Marshall told reporters that the US would “set the paper cities of Japan on fire”, and that “There won’t be any hesitation about bombing civilians” (66). While napalm was first used against Japanese troops in the Pacific Islands, the campaign of “area bombing” of Japanese civilians was led by a man with the “aura of a borderline sociopath” who had, as a child, enjoyed killing small animals (70): Curtis LeMay. LeMay said the goal was for Japanese cities to be “wiped right off the map” (74). To this effect, on March 9, 1945, the US “burned a flaming cross about four miles by three into the heart” of Tokyo, which crew information sheets said was the most densely populated city in the world at the time: 103,000 people per square mile. In the first hour, 690,000 gallons of napalm were used. The city was essentially undefended. Japanese fighters, mostly unable to take flight, did not shoot down a single US aircraft, and air-defense batteries were defunct. By the next morning, fifteen square miles of the city center were in ashes, with approximately 100,000 people dead, mainly from burning. Streets were strewn with “carbonized” figures and rivers were “clogged with bodies” of people who had tried to escape the firestorms. The text contains numerous descriptions and survivors’ accounts, but here I’ll just mention one: A survivor saw a wealthy woman in a fine, gold kimono running from a firestorm. The winds, which reached hundreds of miles per-hour, whipped her high into the air and thrashed her around. She burst into flame and disappeared, incinerated. A scrap of her kimono drifted through the air and landed at the feet of the survivor. On the US end, multiple bombers reported vomiting in their planes from the overpowering smell, blasted skyward by the windstorms, of “roasting human flesh” – a sickly “sweet” odor (81). Neer says this assessment is correct: this was the single deadliest one-night military operation in the world history of warfare, to the present (83). Some 33 million pounds of napalm were used in the campaign overall, with 106 square miles of Japan’s cities burned flat. 330,000 civilians are estimated to have been killed, with burning “the leading cause of death”. Chief of Air Staff Lauris Norstad said the destruction was “Nothing short of wonderful” (84). 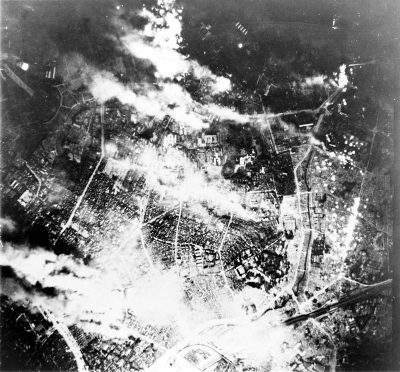 After both atomic bombings (which, individually, inflicted less damage than the March 9 Tokyo area-firebombing), and after the Japanese surrender, but before it had been officially accepted, General Hap Arnold called for “as big a finale as possible.” Accordingly, 1,014 aircraft were used to further “pulverize Tokyo with napalm and explosives”. The US did not incur a single loss in the raid (85). Japan’s best ability to attack the US mainland was seen in its hanging of bombs from balloons and drifting them into the eastward Jetstream. The Japanese government thus managed to kill five people in Oregon. While the atomic bomb “got the press”, American napalm was thus established as the truly “most effective weapon”. While each atomic bombing cost $13.5 billion, incinerating cities with napalm cost only $83,000 “per metropolis” – relatively speaking, nothing. Napalm was now understood by the US military as the real bringer of “Armageddon”, and was then used accordingly in its next major military campaigns in foreign countries. (North America and Australia remain the only two continents where napalm has never actually been used on people. It has been used by many other militaries, largely US clients, but no one has used it to the extent of the United States ). While the text continues tracing the use of napalm up to the present, the sections on the development of napalm and then its first major use, on Japan, are the most powerful – even though, after determining napalm’s power, the US used it more extensively on Korea and Vietnam (in the latter case, mostly, as the author notes, in South Vietnam, where there was no opposing air-force or air-defense). I think this is somewhat intentional, since part of the author’s goal, I argue below, is to justify the US’s use of napalm. This is much easier to do regarding WWII, as it is overwhelmingly interpreted by Americans as a “good war” and thus requires no justification, whereas the selectively “forgotten” Korean war or the often shame-invoking Vietnam war require historical manipulations or omissions to make US actions at least semi-thinkable. So, from here I will give a broader summary and critique of the book. One important theoretical and historical argument that the author makes is that while there was virtually no American opposition to the use of napalm in WWII or against Korea (indeed, there was celebration; in WWII, the press did not even mention human victims in its initial reports of the raids, only property damage ), in the course of the Vietnam war, massive disgust and opposition resulted from the US’s widespread use of the incendiary chemical concoction. (During the Korean war, there was foreign opposition to the US’s use of napalm to incinerate Korean cities. Even Winston Churchill, who oversaw the brutal torture or killing of millions of people elsewhere, such as in India, remarked that the US’s napalm use was “very cruel”: the US was “splashing it all over the civilian population”, “tortur[ing] great masses of people”. The US official who took this statement declined to publicize it [102-3].) Because of concerted opposition to napalm and corporations (particularly Dow Chemical) that produced napalm for the military, the gel became regarded as a “worldwide synonym for American brutality” (224).Neer asserts that a reason for this is that “authorities did not censor” during the Vietnam war to the extent that they did “during World War II and the Korean War” (148). Images of children and others horrifically burnt or incinerated by napalm therefore became available to the public and incited people like Dr. Bruce Franklin and Dr. Martin Luther King, Jr., to engage in group actions to stop the war and the use of napalm. What this says about the effectiveness of imagery and government and corporate control of imagery, and information generally – and about Franklin’s observation that censorship was increased in response to opposition to the Vietnam war (Vietnam and Other American Fantasies) – may be disquieting. However, Neer points out (and in part seems to lament), the image of napalm was never salvaged, except for within a sub-group of personality-types (in this text limited to the rabble) who had always enthusiastically supported its use, referring to its Vietnamese victims in racist and xenophobic terms such as “ungodly savages”, “animals” (130), etc., or with statements such as “I Back Dow [Chemical]. I Like My VC [Vietcong] Well Done” (142).These kinds of statements were often embarrassing to corporate and government officials who tried to defend their use of the chemical on “humanitarian” and other such grounds, in apparent contrast to the low-brow rabble that simply admitted it liked the idea of roasting people alive. When W. Bush used napalm and other incendiaries against personnel in his invasion of Iraq, initiated in 2003, the weapon’s reputation was then such, on balance, that the administration at first tried to deny that it was being used (e.g. 210). In academic biographies of the main inventor of napalm, Louis Fieser, Neer notes that the fire-gel goes mysteriously unmentioned. Attention on napalm due to American use of it in Vietnam resulted in multiple experts and expert panel assessments of the weapon, and the issue was repeatedly raised in the UN General Assembly – which, since the Korean War and the rise of the decolonization climate, had drifted increasingly away from purely Western colonial, American-led control. (During the Korean War, China had not been admitted to the UN and the USSR abstained from participation .) In 1967, Harvard Medical School instructor Peter Reich and senior physician at Massachusetts General Hospital Victor Sidel called napalm a “chemical weapon” that causes horrific burns, and said it is particularly dangerous for children and has a devastating psychological clout. They said doctors should familiarize themselves with napalm’s effects (133). In 1968, the UN General Assembly voted in favor of a resolution deploring “the use of chemical and biological means of warfare, including napalm bombing” (175).In 1971, the UNGA called napalm a “cruel” weapon. In 1972, it again overwhelmingly approved a resolution deploring the use of napalm “in all armed conflicts”, noting it regarded the weapon “with horror” (178).An expert panel agreed, calling napalm a “savage and cruel” “area weapon” of “total war” (176). The United States abstained from or opposed all of these overwhelmingly approved resolutions. While napalm ultimately lost the battle for public opinion, its use today is only technically outlawed against civilians and civilian areas – an agreement reached in 1980 and finally ratified by the US, with self-exceptions of dubious legality, in 2009. Neer even engages in this a bit himself, demonstrating some of what historian Dong Choon Kim notes was an attitude of dehumanization of the “other”. Kim writes that the “discourse and rhetoric that US and ROK [South Korea] elites used dehumanizing the target group (‘communists’) was similar to what has occurred in … cases of genocide”. [iv] Neer, for example, says, using the US’s self-serving ideological framing, that napalm “held the line against communism” in the 1950s and then “served with distinction” in Vietnam – characterizations seemingly intended to evoke strength, honor, and rightness. Neer also says China “invaded” North Korea (96). This is false. The US didn’t like it, but China was invited into North Korea by the DPRK regime. Unlike the US, China did not cross the US’s 38th parallel. The characterization of China as invader in this context is also curious given that Neer never once says the US (or UN) invaded North Korea or Vietnam. US actions are thus never characterized as invasions, while China’s invited defense of North Korea, which remained entirely within that territory, is. Regarding Vietnam, Neer again justifies US action through omission of context such as the Geneva Accords of 1954[v] and the US’s own findings that the vast majority of the Vietnamese population supported the independence/anti-colonial/communist movement that the US was trying to prevent from holding the nationwide unification vote mandated by the Geneva Accords. Also interestingly in this chapter, Neer gives his only editorial characterization of the use of napalm as an “atrocity” – in describing a “Vietcong” use of napalm, which Neer says the Vietcong barely used – flamethrowers were a small part of their arsenal. Yet a relatively minor use of napalm by the “Vietcong” merits a casual editorial value-judgment by Neer as an “atrocity” while no other action in the text does so. Neer at one point says that Cuba and the USSR used napalm against “pro-Western forces in Angola in 1978” (194). In this case, omission is used to condemn, rather than justify, napalm use, since Neer fails to mention that those “pro-Western forces”, which indeed were pro-Western and US-supported, were Apartheid regimes massacring black people and trying to maintain openly white supremacist dictatorships. Thus, when the nature of a regime serves the purpose of justifying American use of napalm, it is highlighted, but when, if the same logic were applied, it might “justify” a non-Western use of napalm, the nature of the regime is imbued with a positive hue as “pro-Western” – thus implicitly condemning the nonwestern forces’ use of napalm. One gets virtually zero sense in the book of the prevalence of racism in US culture during these time periods. It is reduced to a couple of unknown, fringe civilians making comments in favor of napalm – comments then contrasted with the more sophisticated producers of napalm, who are characterized as embarrassed by the ugly racist remarks. The omission of racism stands in sharp contrast to many other histories of the eras, such as Dower’s history of WWII (War Without Mercy), in which he notes that an exterminationist ethos towards the Japanese was present in a minority of the US population generally, but much more prevalent in elite political circles carrying out the US’s military actions. Dehumanizing terms like “Jap” and “gook” are thus never mentioned once in Neer’s text, though they were used all the time. One gets the sense that Neer feels that including the extent of American racism (even race-law; see Hitler’s American Model, by Whitman, or The Color of the Law, by Rothstein) along with his accounts of America blanketing defenseless Asian cities with napalm would allow an image of the US that, though historically accurate, would be too unpalatable to be acceptable. All of this may not be completely surprising given that Neer teaches a course about US history called “Empire of Liberty”, which, for example, includes two texts by Max Boot, often regarded as a “neocon”. I have no issue, in theory, with taking this position, but if doing so requires omissions as large as some of those mentioned above, in at least one case even flirting with genocide-denial, or at least avoidance of the debate, (i.e., completely omitting US-backed South Korean dictatorship), I start to question the position’s validity. Overall, though, if one wants to learn about napalm and some things it illustrates about US history and ideology, this text should certainly be read – in conjunction with others that give a fuller picture of the reality of the times. Robert J. Barsocchini is working on a Master’s thesis in American Studies. Years serving as a cross-cultural intermediary for corporations in the film and Television industry sparked his interest in discrepancies between Western self-image and reality. [i]Neer notes that Eighth Army Chemical Engineer Corps officer Bode said that of the approx. 70,000 pounds of napalm being thrown on Korea on “a good day”, about 60,000 pounds of this was thrown by US forces. P. 99. [ii]Cumings, Bruce. The Korean War: A History. Modern Library. 2011. P. 145. [iv]Kim, Dong Choon. “Forgotten War, Forgotten Massacres—the Korean War (1950–1953) as Licensed Mass Killings.”Journal of Genocide Research, vol. 6, no. 4, 2004, pp. 523–544. P. 17. [v]Neer does mention other Vietnam-related events in the 1950s, thus giving at least some broader context.